Waverly’s Hannah Robinson prepares to throw a runner out at first base during Friday’s 12-0 win over West at home. Robinson struck out 11 batters in five innings. Minford (9-0, 5-0 SOC II) continued their hot start to 2019 with a 10-0 win over Northwest (1-7, 0-5 SOC II). Minford has a double header Saturday against Athens before facing Northwest again Monday while the Mohawks take the weekend off in preparation for their home game with the Falcons. Wheelersburg (7-2, 5-0 SOC II) continued their undefeated streak in SOC II play with a road win over the Oak Hill Oaks. The Pirates will prepare to host the Oaks on Monday with a chance to improve to 6-0 in SOC II play. Portsmouth West (3-3, 2-3 SOC II) was shutout in a road trip to Waverly Friday night, 5-0. West will take the weekend off before hosting Waverly on Monday in hopes of a bounce back win. Valley (3-6, 1-4 SOC II) picked up their first conference win in 2019 with a road win over the South Webster Jeeps (2-9 2-4 SOC II), 5-2. Valley ace Tanner Cunningham pitched a complete game in the Indians win Friday over South Webster while striking out eleven Jeeps and allowing just one hit. At the plate, Cunningham finished 1/3 with one RBI. Jesse Jones had the biggest day for Valley at the plate by going 1/4 with a team high two RBI. South Webster’s Caleb Cunningham finished 1/2 at the plate with a team high two RBI. Valley and South Webster will both take the weekend off before reconvening in Lucasville Monday for game two of their season series. Portsmouth (2-5, 1-2 OVC) picked up their first conference win in 2019 and second win of the season Friday night with a 9-1 win over Chesapeake. Portsmouth will attempt to improve to .500 in the OVC with a win Monday against Gallia Academy. 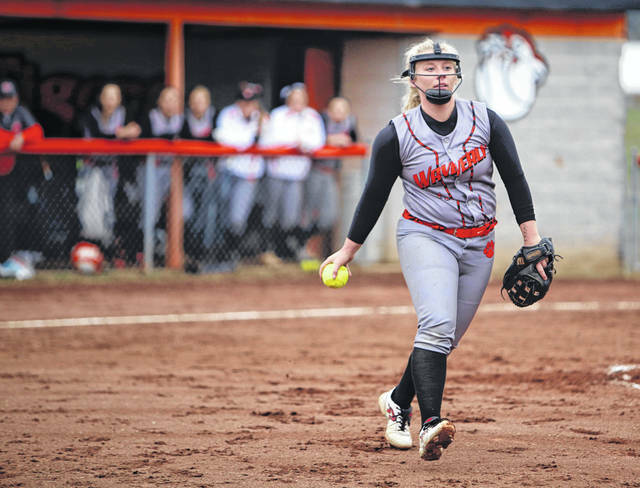 In a five-inning affair, Waverly (5-1, 4-1 SOC II) handed West (2-6, 1-4 SOC II) a loss in conference play Friday evening. Leading the Tigers to the win was Hannah Robinson, who threw all five innings, allowed just one hit and struck out 12 Senators. Zoiee Smith was 2-for-3 at the plate with a double, two RBIs, two runs and three stolen bases. Brooklyn Adams went 1-for-2 with a two-run homer, and Kirsten Blair was 2-for-2 with a double and two RBIs. Haiven Dillow had the only hit for the Senators while Abbi Pack took the loss in the circle. In a matchup that pitted two of the better teams in the conference against one another, Wheelersburg (8-1, 5-0 SOC II) squeezed by Oak Hill (7-4, 2-3 SOC II) Friday on the road. Sarah Claxon picked up the win in the circle, throwing four innings and allowing two earned runs on five hits. Christen Risner paced the Pirates’ offense, going 3-for-4 with a double, a run and two RBIs. Laney Eller followed, finishing 2-for-4, Boo Sturgill was 1-for-3 with a double and an RBI, and Rylie Hughes was 1-for-3 with a double, a run and two RBIs. Thanks to a run in the bottom of the seventh inning, South Webster (8-4, 4-1 SOC II) walked off a winner Friday evening, beating Valley (0-6, 0-5 SOC II) by a 4-3 final. Gwen Messer got the win in the circle, throwing all seven innings and striking out nine. She was also 2-for-4 at the plate with two RBIs while Hayleigh Elliott was 1-for-3 with an RBI. Mack Keller also helped out, going 2-for-4 with two runs, and Emma Bailey was 1-for-3 with two runs. The Titans (9-0, 5-0 SOC I) stayed unbeaten Friday with a six-run win over Green (4-4, 4-1 SOC I) in Franklin Furnace. Earning the win in the circle was Cassie Schaefer, who threw seven innings and struck out 11. At the plate, the Titans had 13 hits and were led by Isabel Cassidy’s 3-for-4 day. Mady Suter also chipped in, going 1-for-3 with a home run and two RBIs while Claire Dettwiller was 1-for-3 with a double and two RBIs. For the Bobcats, Kasey Kimbler was 2-for-3 with a double and two RBIs while three other teammates had one hit each.